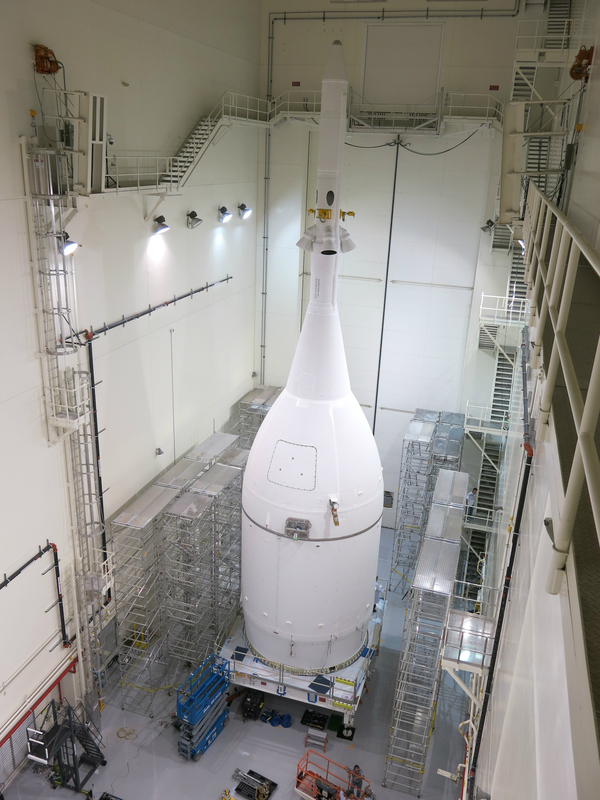 October 30, 2014 – NASA and Lockheed Martin have completed final assembly and testing of the Orion spacecraft. The spacecraft will remain inside NASA’s Launch Abort System Facility at Kennedy Space Center until it rolls to launch pad 37 in November. The final assembly stages of the spacecraft included installing Orion’s Ogive panels, which protect the crew module from harsh acoustic and vibration environments during launch and ascent. Engineers also installed fasteners to secure the panels in place and covered them with a thermal protection coating. Orion was then lifted by crane, rotated into the proper orientation for mating with the Delta IV Heavy launch vehicle, and placed onto the transport pallet. The team then performed a fairing purge test, which verifies how much dry gas needs to be pumped into the space between the Ogive panels and the spacecraft. The dry gas ensures that when Orion is transported to the launch pad, it does not accumulate moisture, which could cause corrosion and contamination. When Orion arrives to launch pad 37 it will immediately be lifted 170 feet up and mated to the United Launch Alliance Delta IV Heavy rocket. Over the next few weeks, the rocket and spacecraft will be integrated, powered up, and interfaces between the two will be verified in preparation for Exploration Flight Test-1 (EFT-1) on December 4. During EFT-1, the uncrewed spacecraft will launch on a Delta IV Heavy rocket and will travel 3,600 miles beyond Earth—15 times further than the International Space Station. That same day, Orion will return to Earth at a speed of approximately 20,000 mph for a splashdown in the Pacific Ocean. EFT-1 will provide engineers with data about systems critical to crew safety such as heat shield performance, separation events, avionics and software performance, attitude control and guidance, parachute deployment, and recovery operations to validate designs of the spacecraft before it begins carrying humans to new destinations in deep space.